Turtix is rated 4.4 out of 5 by 14. Rated 5 out of 5 by Maztergee from Beautiful Colourful Graphics Such a colour platform game with great sounds, and playability. One other thing I love about this game is you can use a standard usb game pad which is much easier to control the character, very smooth. Nice sounds effects too, Kids love it. Rated 5 out of 5 by SeansMommy from WE LOVE TURTIX!! My 3 year old son and i both love this game! It's fun, has great sounds and graphics, and is great for the whole family!! I also love when Turtix rescues the baby turtles and they say "thank you" in the cutest little voice. A+ game! 5 STARS FOR TURTIX! Rated 5 out of 5 by purpleporpoise from Cute platform game! Help Turtix free his friends! Very, very cute game and storyline! Turtix is adorable! The graphics are pleasing, sharp and bright. Very cheery game. Alas, try as I might, I'm just not into platform games. But this one was fun to play and I'm a little better at them now than when I tried playing Super Mario with my daughter decades ago. Frankly, I stank and kinda still do, especially using a keyboard instead of a game controller! This would be a good family game for adults as well as children. A nice diversion from the dark HOG games. Rated 5 out of 5 by ladent511 from Beautiful This is my favorite game. Story line is short and simple.The artwork within it is gorgeous. It gets progressively harder as your go through the levels. 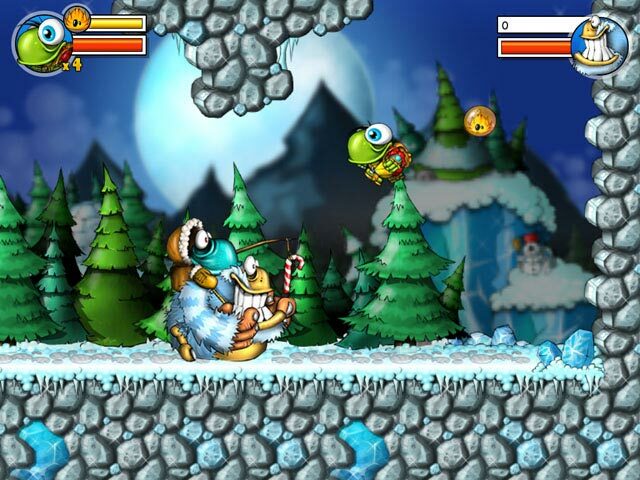 I try to challenge myself by collecting all the gems, destroying all the enemies and finding all the secret places. You have the option to play it easy-hard. I have had it for a couple of years and I still play it although I have beaten it many times. Rated 5 out of 5 by tanab from Great Game! If I could give this game 10 stars I would. I've owned this game for over a year and it is one of my ol'faithful games that I go back to time after time. I wish I knew how many hours I've spent enjoying this game. My grandson (6) used to play all the time. we go in streaks as to what our favorite game of the month. I had not played Tutrix in a long time & when I saw it come up on the $2.99 deal I went back & played a level. I managed to get thru level 3-10 on hard & had to try twice. I like that kind of challenge. I find the controls to be just fine. I use the mouse 99% of the time. There are a couple of tricky spots where I find I need the arrow keys for best control. It does require considerable skill to be good. I love going throught the levels with the darling little turtle. I never tire of the cute little voice saying "thank you". A much better game than Trutix 2. Rated 5 out of 5 by gbo1 from It's a buy today! I've just discovered this game today for $2.99. I so enjoy a really good platform game. There are so few of them. 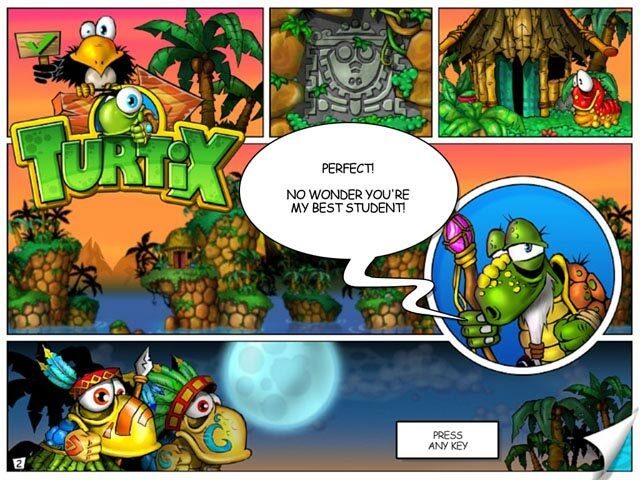 Our hero, Turtix, is on a mission to save baby turtles and retrieve pieces of an amulet that he accidentally scattered around the islands. The art, color and designs are gorgeous. Very vivid. It's not as easy as it first appears. Like all good games, it becomes more difficult with each level. You do have to use a lot of brain power to figure out how to open all secret areas and gather all the jewels. It's a buy today for $2.99. I would have paid $6.99 when this first came out a few years ago had I known about it. Well, I'm off to buy and also download Turtix 2. Rated 5 out of 5 by Pearly11 from Oh Boy lol I used to play platform games together with my son when he was little and mainly because it amused him so much how rubbish I am at these lol. An hour has passed and I have to admit that I am still rubbish at these type of games. But on the bright side, I had a lot of fun. 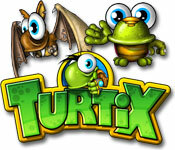 You can play turtix with either arrow keys or mouse. I played with the mouse, but I think the arrow keys may be less stressful on the hand / arm. 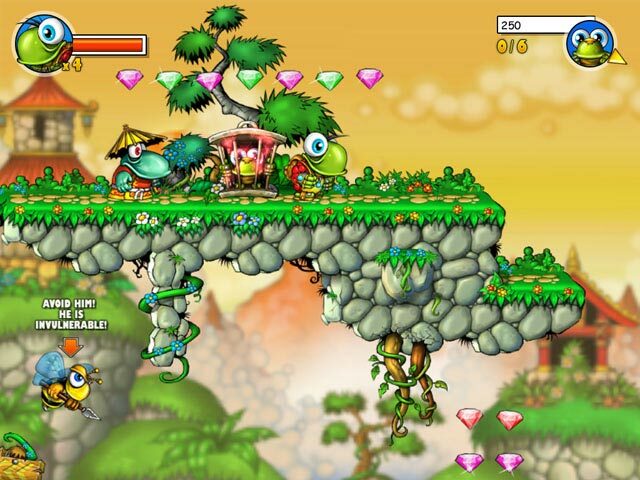 On your quest, you need to collect gems and that involves a lot of of jumping onto different platforms. In the process you come across enemies which you eliminate by jumping onto their heads and then kicking them with the space bar. To open a portal that will let you enter the next level, you have to find and free all the turtles in the level by jumping onto the cages in which they are trapped. I am not so sure if this is all you need to do, because I am so absolute rubbish at platformers that took me one hour to get to level three lol :-). Now am completely knackered, as for me playing a platformer is like an all-over body work out. I have no idea why I feel I have to jump also, every time I prompt the character to do so. I think the game is excellent value for money as the D/D today and I consider a purchase. Great for your own or visiting children. What you need to do and how to do things is very well explained. You may want to turn the music off, because that really drove me potty after a while. Rated 5 out of 5 by silentpages from The only keyboard game I have ever loved I haven't played this game for years, but the arrow keys and enter are mostly what you use. It's not a simple game. You have to use your brain in the later levels to remember where you are/have been/need to go. This game is truly fun for most ages. As all games do, this starts silly easy so you can learn how to play it. Please don't play the first couple levels, then poopoo on it!